The FT's wine correspondent Jancis Robinson tastes Baltos and Bembibre - Dominio de Tares | Dominio de Tares es una bodega de vanguardia en la Denominación de Origen Bierzo. 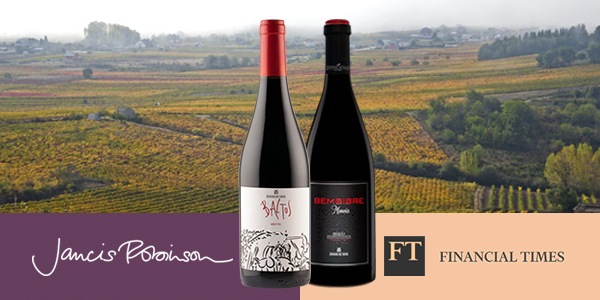 The FT’s wine correspondent Jancis Robinson writes about Baltos and Bembibre. For her, the first one “had lovely, immediate fruit and charm with the racy nerve for which Bierzo and Mencia are famous well in evidence”. And Bembibre 2015 “is certainly good enough to stand on its own two feet. Made from “very old” vines at an invigoratingly high elevation and aged in French oak barrels for 15 months, it should ideally be kept a few years to smooth its rough edges even though it’s every bit as sumptuous and velvety as many a Pomerol, with the additional energy of a good quality Bierzo”.